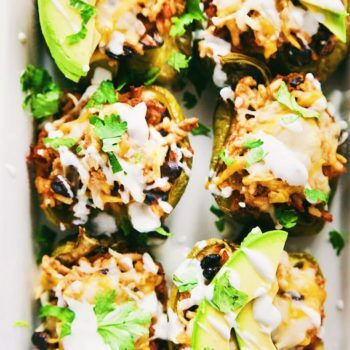 Healthy & quick stuffed peppers with ground turkey and black beans! A flavorful meal that requires minimal ingredients and under 1 hour to make. In large saute pan cook ground turkey with 1 Tbsp olive oil, garlic powder and salt till meat has cooked through. Add rice, black beans, salsa, 1/4 cup cheese, cumin and chili powder to cooked turkey. Remove from heat and set aside. Halve peppers and clean out seeds. Brush with olive oil and fill peppers with rice mixture. Bake in oven for 20 minutes. For last minute sprinkle cheese on top of peppers and let melt! Garnish with cilantro and favorite toppings (I used avocado and light sour cream!) and serve! If you don't have brown rice, you can use white rice or quinoa to stuff your peppers with. Make vegetarian? If you'd like to do this recipe "meatless" simply remove the turkey and double the amount of black beans. To keep these stuffed peppers fresh, store in a sealed container in refrigerator for up to 3-5 days or freeze.